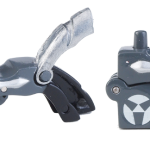 Transforming weapons that have push button activation. 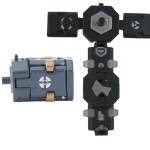 Connect to Bakugan, Mechtogan and Mechtogan Titan for G-power boost in battle. 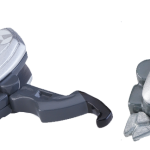 The BakuNano are a new addition to the Bakugan line as season 4 begins, as equals of the Bakugan Battle Gear. 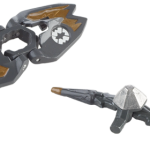 While season 3 had the battle gears, season 4 Bakugan: Mechtanium Surge has the BakuNano as weaponry that can be attached to the Bakugan, Mechtogan, and Mechtogan Titan. They also follow the same three Attributes of the battle gears --- Gold, Silver, and Copper. 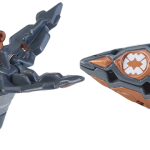 February-March 2011: As the fourth season starts, six BakuNano were introduced in the first wave of Mechtanium Surge Bakugan released. May-June 2011: Four more BakuNanos will be out come May-June! 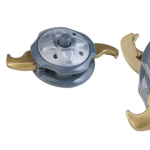 BakuNano are used to weaponize your Bakugan, Mechtogan, or Mechtogan Titan. You are allowed to have up to 3 BakuNano in your set. The BakuNano is not considered as a support piece like the Mechtogan, Battle Gear, Mobile Assaults, or Trap. It is treated separately, which means you can have two support pieces AND 3 BakuNano in your set. 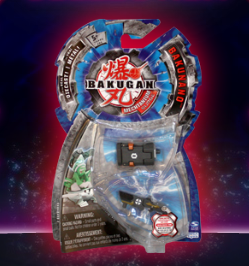 BakuNano can be played with the Bakugan, Mechtogan, or Mechtogan Titan. When in play, the Bakunano's Attribute (Gold, Silver, or Copper) should match the Gate Card's color. 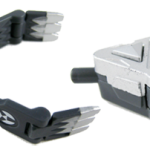 Attach it to your Bakugan or Mechtogan or Mechtogan Titan and then add the G-power of the BakuNano to your battling monster's G-power. 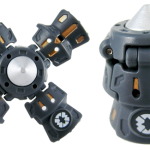 If your Bakugan does not have holes for the BakuNano, then just open the BakuNano and place it next to the Bakugan in play. You can use all of your BakuNano in one battle, and in one Gate Card, just as long as the BakuNanos' Attributes are the same with the Gate Card's color. 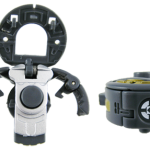 You can also use your BakuNano even when you have already boosted your Bakugan with a Battle Gear, Mobile Assault, or Trap. Take note that when you use the Bakunano on your Mechtogan in battle, then that BakuNano will simply go to your used pile. But if you use the BakuNano on your Bakugan, then that BakuNano will be removed from the game. The Aeroblaze was used by Horridian and Anubias, and is the first ever BakuNano shown on the show. 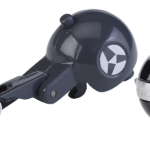 Next comes the Shoxrox which was used by Chaos Bakugan Flash Ingrams and the brainwashed Bash Brothers. Robin, of Team Anubias, joined the Battle Royale with Bolcanon and used the Hyper Pulsor to eliminate the other competitors. Soon, of Team Sellon, also joined the Battle Royale and she used the Slicerix on Krowll in battle. The Lanzato was also first shown with Wolfurio and Rafe as they tried to stop Silent Strike attack Taylean.